Be the first to share your favorite memory, photo or story of John Alan. This memorial page is dedicated for family, friends and future generations to celebrate the life of their loved one. 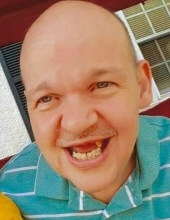 John Alan Burdette, 57, of Cross Lanes, passed away peacefully Sunday, February 24, 2019 with his family by his side. Alan was preceded in death by his mother, Betty Burdette and father, Howard Burdette. Alan is survived by his brother, David Burdette and sister-in-law, Teresa of Cross Lanes; brother, Gregory Burdette of Mount Olive; sister, Joyce Shirk and brother-in-law, Stu of St. Albans; nieces, Joanna Parsons and husband, Jason, Jennifer Woods and husband, Mike, Ashley Andrews and husband, Jonathan, Melissa Davis; nephews, David Burdette, Matt Tyson and wife, Jordan. The family would like to offer a special thank you to NSICU at CAMC-General for taking such loving care of Alan. A celebration of Alan’s life will be held at 12 Noon Sunday, May 19, 2019 at Little Creek Park, South Charleston, WV. You may visit his Tribute page at AffordableCremationsofWV.com to share your memories with the family. To send flowers or a remembrance gift to the family of John Alan Burdette, please visit our Tribute Store. Guaranteed delivery before John Alan's celebration of life begins. "Email Address" would like to share the life celebration of John Alan Burdette. Click on the "link" to go to share a favorite memory or leave a condolence message for the family.